Statement: HK-47, HK-51, and HK-55 are ready to serve XCOM, Commander. Assassination protocols engaged, prejudice set to maximum. Termination of alien meatbags will commence on your command. This mod adds models for the lovable, homicidal HK-series droids from Star Wars: The Old Republic as soldier armour. Separate torsos, arms, and legs are included for HK-47, HK-51, and HK-55 Mk2 (mid-KOTFE), with heads for each as helmets. An invisible head is available via my SW Alien Head Pack Extra - Base Heads (WOTC) mod, which is a prerequisite for this mod. Support has been added for robojumper's Add Part Names mod (currently awaiting a WOTC version), which enables torso, legs, and paired arm armour parts to be properly labelled with their name in their relevant Props sub-menu. 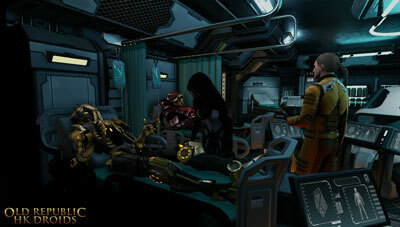 then you need RealityMachina's mod. You may also wish to use Mertius's SWR Full Crew Avenger WotC mod to increase the numbers of soldiers wandering around between missions. Make sure to follow the instructions regarding reinitialising your settings to make it take effect. If you are importing characters from a pool that used the legacy/base game version of the mod, those customisations will be broken in this version of the mod. The two different versions of the game have necessitated unavoidable changes to part template names to avoid clashes when both versions of a mod are installed. You will have to remake your characters in the editor. Limitations on adding new heads and the requirement of dealing with non-hidden teeth and eyes means that the original HK head meshes had to be scaled up. They are thus a little bit oversized compared to the originals. The textures are less than perfect. Unfortunately I lack the skill to properly convert traditional textures to PBR. It also doesn't help that results tend to look wildly different under different light sources (in a manner that doesn't seem to reflect an accurate PBR implementation), making adjustments something of a frustrating exercise. It probably would have been quicker to create all new PBR textures from scratch. The source textures for 47 and 51 were only 1024x1024, which also doesn't help. Because of the way the bodies were originally modelled, there are a few issues with clipping and shoulders popping out of their sockets. I did experiment with more graduated skin weights to try and introduce some flex (despite a metallic droid chassis flexing when it moves its arms not making much sense), but the result was actually worse given the low subdivision. This is most apparent during firing animations. I may try to address this in a future update. Original mesh and texture content derived from the Star Wars: The Old Republic MMO. All rights belong to EA/Bioware and Disney. This mod makes use of E3245's Extended Material Library, probably somewhat unnecessarily. Pictures of HK-47 show him using the M82A1 sniper rifle from E3245's Barrett M82A1 AMR :: CoD4: Modern Warfare Remastered mod. Content not included in this mod. Pictures of HK-47 and HK-51 show them using the XCOM: EU/EW pistol from Mr Kablamm0fish's XCOM EU/EW Ports: Tier 1 Weaponry mod. Content not included in this mod. Several screenshots take place in maps generated by McDenny's 09's Even More Maps! - Suffer mod. The initial inspiration for this mod came from Jafrica's HK-47 Voice Pack. Lack of further development of that mod prompted me to create my own HK voice pack, and subsequently this mod to go with it. So I might´ve already asked this once, but I´ve seen that you´re porting from SWTOR. I´d like to ask you to port the Makeb assault armor for both genders if at all possible! You´re doing amazing work and I hope you´ll take my request into consideration :) I´d love to play around with those armors :) Keep up the good work anyhow. I can't seem to find voices for him. How do? Seeing as I don't own the content, I'm not in a position to stop anyone else reusing the assets. I would appreciate attribution and a link back to the original mod/s however. Some of your other voice packs and head packs would also be good for bounty hunters (I was really impressed with these by the way. More options for playable species than SWTOR gave). I’ve put a demo of the work in progress on Youtube if you’d like to see a sampling of what I’ve come up with so far: https://youtu.be/ZjDkxTJVKZ0 . @NCR4077 The heads should be in the helmets category. No. SPARKs use an entirely different non-humanoid rig.